What expectations do employers have for fashion design students and entry level jobs? First, let’s get one thing straight. Brands know that you are a recent grad and entry level. They don’t expect you to know everything or have a ton of work experience (check out episode 18 of the SFD podcast with Dior Bediako from Pepper Your Talk for more on this). They also know what you’re getting (and not) at school. I talked to a few industry experts in NYC who told me they see trends in what skills recent grads do (and don’t) have coming out of FIT / Parson’s. They know that FIT recently cancelled the fashion portfolio class (one reason I wrote this book). They know your Illustrator skills are not as good as they need to be (I have 100+ free tutorials to help you with that). They know you don’t know everything (no one ever does, don’t feel bad). Which is why, by reading this book, you’re already 10 steps ahead of all those other grads (great work, you should be proud!). If you can show you know just a little more than them, you already have a leg up. When it comes to what employers expect to see in your fashion portfolio, make sure you include flats and tech packs that are technically accurate and detailed. They want to know that you understand what stitching goes where, what closures the garment has, and show you have knowledge of garment construction. When you’re hired as an entry level employee in the fashion industry, you’re not going to be designing. Now, you’re probably wondering about the senior collection you designed. Should you include that? Listen, I’m not here to tell you to leave that hard work out of your book. You should be proud of it, and you paid a lot of money to learn how to design it. So, what I’m going to say next is going to hurt. It’s going to make you wonder what school was even for. And I’m not going to be the only one to tell you this. I say this lightly and with exception, but for most brands and where most opportunities exist, this is reality. Your chance of getting hired at a high fashion brand that’s looking for the next up and coming designer like you to bring fresh life to their line is pretty slim. And I don’t say this to be a dream crusher, I say this to be realistic. Because here’s the thing: school work is very conceptual, and most brands are very commercial. I’m not going to tell you whether to include it or not. Evaluate your body of work, and decide whether it should be in there. If you have an internship (read: real life) project that’s more relevant, you should probably give that precedence and put your senior project second or third (or leave it out altogether if you have enough  real life examples). “Enough” is a judgment call you’ll have to make. Here’s what I will tell you: most brands / hiring managers will take a few seconds to look at your “real” life experience and gloss over your senior project. It’s harsh for me to say, and it’s harsh for you to hear, but they really just don’t care that much. And it’s not relevant to the job requirements. Focus less on showing fancy illustrations and photos of your finished garments (often what I see in a lot of student books) and more on showing accurate and detailed Illustrator flats / tech sketches. Remember, they’re not hiring you as a fashion illustrator or seamstress, they’re hiring you to sketch flats in AI and work on tech packs. 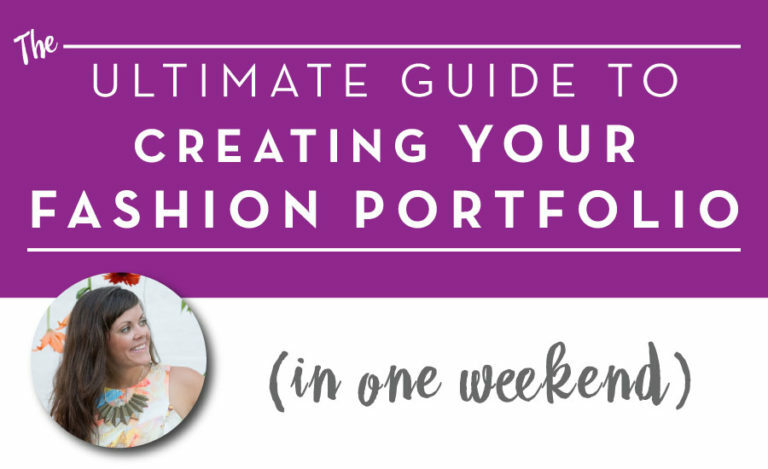 7.2: How do you make sure your fashion portfolio looks professional and not like a student’s? As we’ve already discussed, brands know you’re a recent grad. This isn’t something you should be hiding or feel ashamed about. That said, there are a few things you can do to make your book look more professional. One of the biggest red flags that’s going to scream “student, STUDENT, STUDENT!! !” is showing photos of your hand sewn designs that your classmate modeled in your poorly lit apartment. I don’t mean to hurt your feelings. Because honestly, my sewing abilities are not production line quality and I don’t have any friends who are models or photographers either. Back around 2005 when these photos were taken, I thought they were fabulous. And I know some of you have photos just like this because I’ve seen them in your portfolios. The senior show runway photos. The friend modeling your designs photos. The selfie photos (!). I know that, like I did, you probably think yours are fabulous. But they do not belong in your portfolio. The point here is, unless your garments / model / photos of your own work really come off “professional” (subjective, I know, and you’re going to have to make the judgment call), leave them out. I know you are proud, and you should be, but this is also the number one thing that will make your fashion portfolio look less professional. The other thing that screams “student, STUDENT, STUDENT!!!”? Showing tiny projects that attempt to showcase a multitude of skills. None of them have anything to do with each other, and it’s all over the place. I know this is really hard to hear. I know you may have just completed a $100k+ degree and are thinking WTF! I have NOTHING to show! Listen, there’s crossover with some of this, arguably textile and design have the most. And it’s ok to show some print designs if that’s part of your work. But visual merchandising? That’s a whole different job and department. If this is what you want to do, then create a visual merchandising portfolio with more than just one photo of a mock store window you styled. The main point here is to make sure your fashion portfolio isn’t a mish mash of a bunch of tiny disconnected bits. You’re better off showing just 1 or 2 complete, PROCESS PORTFOLIO projects from school work, and any relevant design / flats / tech work you’ve done as part of an internship (or class). I know this may come off harsh. I know you may be feeling really upset right now. And I want to remind you that I’m here to help you. Part of that is not sugar coating things. Because it’s better you find this stuff out now than a year later after not finding any work. So, keep reading, take the advice from this book, make some adjustments to your portfolio, and put yourself out there. There are opportunities, there are jobs, and later on, I’m going to tell you the number one thing you can do (especially as an entry level candidate) to make sure you get the job. 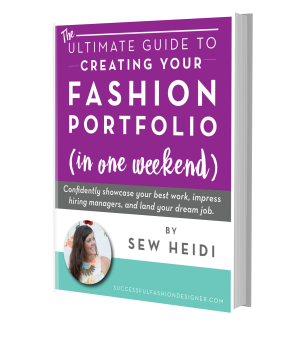 It’s right up there with making sure your fashion portfolio and communication is customized. It’s right up there with showing a brand that you’re paying attention. This one thing is so simple (and has nothing to do with your portfolio). Yet it’s mind blowing most people don’t do it. 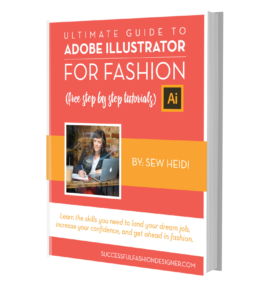 7.3: What should you include in your fashion portfolio if you don’t have much experience / only school work? It’s ok if you don’t have much experience, we all start somewhere. But do your best to get at least one internship to gain some real life work opportunities. Even if internship projects are done as a team (as they most likely will be), you can still include the designs in your portfolio as we already discussed. If you don’t have any experience outside school? Then show your school work. 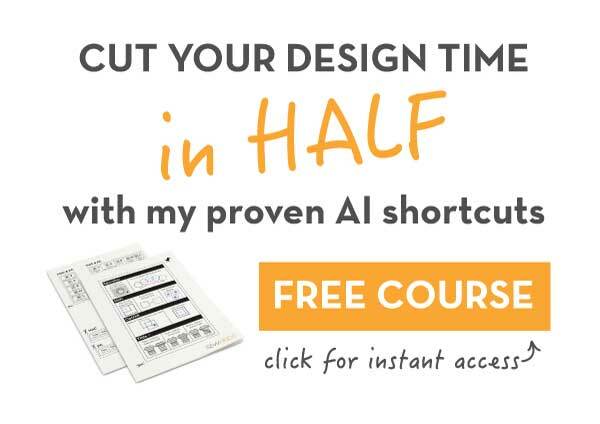 Just make sure the sketches from your collections (no matter how conceptual your designs may be) show that you understand how to emulate accurate construction and finish details in Illustrator. Bonus points if you include a few closeups of how closures or pockets are constructed, and a few tech pack sample pages to show you know how to spec the fabric and colorways. Because like we already talked about, unless you’re 1 in a million, you’re not getting hired for “design”. You’ll start at the bottom, and that means your flat sketching and technical skills need to be sharp. Brands are more concerned with your ability to communicate design and style details in flats / tech packs than they are in your design aesthetic or ability to draw beautiful fashion illustrations. Don’t worry about your flats looking immaculate, worry about them looking accurate. Because these are the skills most brands are looking for when hiring entry level staff and recent grads. By signing up, you’ll get access to weekly emails with free tutorials, templates and occasional offers. 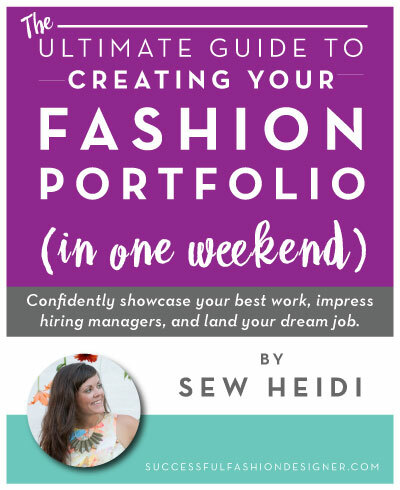 Chapter 6: Can You Include Client / Company Work in Your Fashion Portfolio?